I messaged a second person in an attempt to increase the odds a bit. It would seem that the Cinemax presentations were FAR better and in their OAR which is also good news. I am currently downloading these 3. We shall see how they are. I could not find any of the prequels from Cinemax though. I can say they are very good indeed! People think that a *mere* MPEG2 HDTV recorded broadcast has low quality, but it's not (always) true: look at The Abyss Cinemax, for example; it is gorgeous! These are the 2004 releases I'm guessing? It seems it's a new master - at least, in comparison to other HDTV versions; more info in The Abyss thread. I was referring to the Trilogy stuff, I have The Abyss TC and DC already. Yes, the MPEG2 HDTV versions of the 2004 SE (that should be implicit, until we'll... cough cough... find the 1997 SE versions!) are very good indeed! Can't say it them, or the AVC versions, are better than Blu-ray (mine is still srinkwrapped, waiting to be used for a restoration, maybe...), but I think they are, at least according to many projects around using them as sources! I'm still working on locating the PT from Cinemax ..... no luck so far. rutracker has the hybrids for the entire set of Star Wars movies. Unfortunately ... these 2004 ones I downloaded ..... have Russian language. Well, you could still mux those video with DVD audio! Quite *easy*, you need the NTSC DVD and TSmuxeR. I have those to work with. I'm also snatching the WookieGroomer hybrids ..... I'm guessing these are 2004 source as well? I have always hoped that the TB sources actually had a larger raw file available somewhere but sadly, I have not come across any of them. 5.1 ac3 audio extracted from DVD's ..... moving on to remuxing to see if I have to adjust audio for sync. Movies are 29.97 with pulldown. The HDF French versions are out there for the prequels. They are sourced from the original raw Sky UK rips muxed with French audio. Would you mind sharing your source for the Cinemax rips? They are from torrents. Pm me with your e-mail. Audio sync is turning out to be more of a challenge than I thought it should. Not sure how to proceed at this point. Got my set of WG Sky/Premiere hybrids as well. Maybe the English audio from those will be better for sync. check my versions posted on the spleen. its a redo of WG's set, but actually frame synced to the 2004 DVDs. It already has the DVD audio. The spleen has been down for most of the day since last night ...... when it's back up I'll go check. WG made some alterations to his versions of the 2004 SE, FWIW. He color corrected Ep IV and Ep V but he was more aggressive about it with Ep V. He also edited IV so Han would shoot first. I'm still having issues. Trying to reset my password but it tells me my answer to my secret question is wrong ..... LOL. I KNOW that it is not. They really must have had some issues for all this to be an issue there. I wonder what happened. 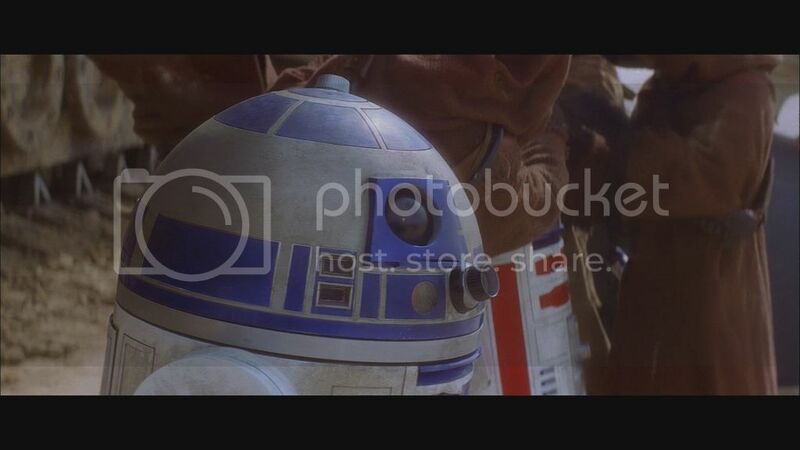 I found this frame on what I believe is the ANH WookieGroomer upload at rutracker .... I say it's odd because it comes after Red has his bad motivator malfunction which left R2 all by himself in the line of droids. So it hasn't been fixed by any HDTV project yet? It seems so... until now, at least; but I'll be happy to prove myself wrong!